Bagels 100% Sourdough. Opinions 100% Mine. These bagels are 100% sourdough-leavened. Some people will tell you that makes them superior to the ones I have posted in the past, which use a small amount of yeast in addition to sourdough. This is wrong. They’re not better, just different. More sour. Very good. Don’t make the dough too wet. The hydration of this dough is about 55%. Mix the dough until it is strong strong strong. I mean strong! I have always thought that my bagel dough, after coming off the mixer and taking a few turns by hand, had the feel of a brand new tire. I have been ridiculed for this analogy by more than one person I’ve mentioned it to, but it’s my story and I’m sticking to it. Come on people, don’t you know what I mean? Haven’t you ever run your fingers across a display tire in the tire store and felt its dry, silky smoothness, firm but with just a tiny bit of give? That’s what the surface of your bagel dough should feel like. Some people have suggested that a balloon would be a more apt comparison. Nope. I’m sorry, it’s a tire. You make your own bagels, you can analogize however you want. And while we’re rendering opinions, I’ll reiterate mine about shaping. Rope method all the way. You get a rounder bagel, and that overlap that unmistakably marks them as hand made. Please do not argue. Make sure you use non-diastatic malt powder (non-diastatic means the enzymes have been deactivated). If you can’t get it, you can use barley malt syrup, found in many markets and health food stores, or, in a pinch, brown sugar. Mix the milk powder and the malt into the flour with your hand before adding these ingredients to the mixer bowl. This keeps the milk and malt from clumping when they get wet. A spray bottle of water is useful during shaping in case the dough feels too dry or has trouble gripping the counter for rolling. After you roll the dough into a rope, there may be a “seam” running along its length. Make sure when you join the rope ends together that this seam is on the bottom of the bagel, or it may tear open during baking. I made this batch of eight bagels in my KitchenAid mixer. Your mixer may not be able to handle any larger batch of this very stiff dough. If you freeze these, pre-slice and individually wrap them. You can then pop them in the toaster without thawing. Combine the starter, water, flour, malt, milk powder, and salt in the bowl of a stand mixer. Mix on low speed to combine. Mix on medium-low speed until the dough is very smooth and strong, almost rubbery. How long this takes will depend upon your mixer. Divide the dough into 8 pieces of about 100 g each. Form each piece into a light ball, cover, and let rest for 10 minutes. Meanwhile, line a cookie sheet with parchment paper and dust it generously with semolina. Place the bagels on the prepared cookie sheets, and slip into a large food-grade plastic bag or cover with plastic wrap. Proof for about 4 hours at warm room temperature, until the bagels look and feel a bit puffy. Then refrigerate them for 4 – 8 hours. Turn the oven down to 400F once the bagels are in. Bake until golden brown, about 24 – 26 minutes. 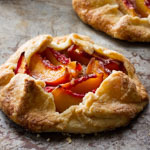 About halfway through baking, open the oven door briefly to vent any steam. These sound wonderful and by the strong conviction distinctively unique. I am going to give them a go. Thank you for the attention to detail in this and all of your recipes. I just wanted you know that that I use your other recipe all the time (Since I didn’t want yet ANOTHER type of flour taking up space in my freezer. Rye, wheat, bread, AP and pastry should be enough, right? No? Yeah, I didn’t think so.) and love it! I even made them for my sister who’s from NYC and she liked them *even better* than NY bagels. Then again, it’s hard to compete with SD bagels handmade by your kid sister. : ) Thanks so much for the previous recipe and this one! I’ll have to whip up a batch in a day or two. Thank you for another sourdough recipe! I love your tire analogy, by the way….bagels are a really stiff dough! You have to have a pretty powerful mixer to whip up these babies ~ can’t wait to try ’em out! I value your opinion very much. And, I am tempted of making another bagel. YUMMY! These look amazing! I am definitely going to have to try them. I had to leave a comment because I just think these are the prettiest bagels I have ever seen!! AND you made them in the courtesy of your own home!! Very impressive! Awesome Bagels!!! I love your blog… to the point yet a hint of a slyness. Makes me grin big time! 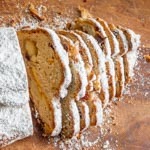 Thanks for sharing… I’ve tried your recipe with a hint of instant yeast… must try this 100% sourdough! “…to the point yet a hint of slyness” — LeeYoung is exactly right! I love your blog & can always trust your formulas to perform like champs. 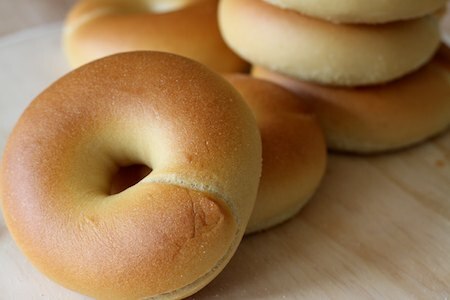 Having eaten many a NYC bagel in my day, I’d love to try these and see how they compare! So so prettily smooth and shiny! Yes I agree, bagel dough must be about the stiffest dough in the world. Got to agree: ropeys are way better than pokeys, any day. Those bagels look insanely perfect – so smooth surfaced. How did you bypass the Birds Eyes if you proofed in the fridge for 8 hours? I’ll have to give these a try sometime soon, see how they compare to my current all-sourdough recipe. The default bagels available in this house are your Bagels Revisited. We love them. I really want to try these, but it will have to wait for next time. This week’s batch of bagels is for sharing, and I don’t want to experiment. Rcakewalk, yes, I would substitute one for one by weight. How on earth do you get them look so perfect? I mean, look at the surface… it’s perfectly smooth. Oh my god. I cannot believe the perfection of your bagels. Ok, I will switch to the ropey method, I’m won over. Only two things would make them even better: dried Michigan cherries mixed in, and fresh goat cheese on top of the toasted halves:). Going to try these for the Easter breakfast table! I just made my own cream cheese, what is missing are these beautiful bagels. 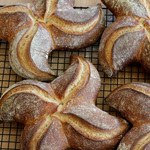 I put them om my list of breads to bake, a very long list with a lot of WildYeast breads. 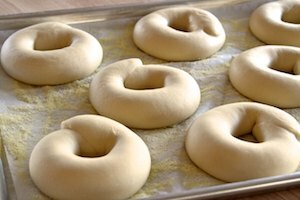 Can’t wait to try these – I’ve been wanting to make 100% sourdough bagels since I’ve had my starter going. I made a batch of regular bagels that just about killed my mixer. I have a Kitchen-Aid too. What HP is yours? Thanks! can i use a convection oven for it? I made these bagels yesterday exactly as written. They were delicious and chewy. My only problem was they were a bit flat. They were puffy before retarding and even after removing them from the fridge. It seems after the boiling they flattened out. Should I let them warm up a bit after retarding? Should I boil them longer? I also found at 27 minutes in the oven they still had not sufficiently browned. Jemiko, yes, you can use a convection oven. You may need to turn the heat down by about 25 degrees. Anna, you might need to bake them longer or turn the oven temp up a little to get better color. You shouldn’t need to warm them up after retarding or boil them longer. It could be that your dough was not sufficiently strong. Did you use high-gluten flour or add extra gluten, and mix the dough so the gluten was very well developed? I did use high gluten flour.I do not have a mixer so I mixed by hand which is a serious workout. I probably didn’t mix long enough. I am trying again soon so I will follow up with my results. Thanks Susan. Shea, Sourdough Companion and The Fresh Loaf are both wonderful baking community forums with photo-posting capabilities. Feel free to post the recipe with a link to this page. Blueberry bagels sound wonderful! Wonderful bagels! I think I’ll follow your example and (your recipe) tomorrow. Wonderful recipe, Susan…thank you so much! I made these and the Norwich Sourdough bread today. I miscalculated time-wise and had to refrigerate the bagels after only one hour, and I left them in the fridge about 9 hours total. I float tested them after they came to room temp and proceeded once they floated in a bowl of cool water. I have been baking bagels for months now on a weekly basis using ADY. I had no idea how different the taste and texture of these would be, but WOW! I am HOOKED! 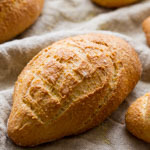 The sourdough flavor is incredible and has a tendency to linger in the mouth…not like an aftertaste, which can be unpleasant -more like a fond memory. LOL. Thanks again for your wonderful blog, advice and recipes. I just made these. YUM!!! I used sorghum molasses instead of malt…same weight and it turned out very chewy and nice. I also kneaded, let rise one hour in warm area, made into bagels, boiled and baked…NO parchment (which I always struggle with and NO fridge time! I used maple syrup in the boil…they were wonderfula dn a lot less hassle! Highly recommend!!! Thanks Susan! What type of milk powder do you use, instant or non-instant? I have so much lovely levain to use that I really appreciate your 100% wild yeast recipe. I made these using wheat gluten added to white bread flour, substituted malt with brown sugar, used enerG egg replacer instead of powdered milk (because we are vegan), and mixed by hand (this was hard because I have no stand mixer but totally doable) and they still came out delicious. I will try them with the proper ingredients (sans milk and mixer) next time to compare, but yeah great recipe thank you! Thank you for sharing this awesome recipe! I’ve made other bagel recipes in my Kitchenaid and it always worried me that it would strain the motor. The amount of dough your recipe makes is just right for my Kitchenaid and it had no trouble kneading the dough as long as I needed to really develop the gluten. I just made 2 batches back to back since I wanted enough to freeze. I used malt syrup in place of the non-diastatic malt powder. I also let them rise at room temp for nearly 5 hours. It’s winter so I just put them outside to chill. After a couple hours, I noticed it had dropped below freezing outside so I brought them back in for a little over an hour. I put them back outside to chill back down and firm up about 45 mins before boiling. They turned out better than any bagels I’ve ever made! Great crumb- perfect amount of chew without being hard or too dense with lots of little holes and a thin, crispy, beautiful crust. 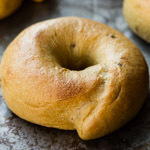 This will be my go-to recipe for bagels now. Thank you! web programmers; they must study it and perform the practice. Fantastic recipe! My husband is from NJ and he has given your recipe the seal of approval! These are JUST like East Coast bagels! Bravo! On a side note, I am such a fan! I found your blog about 2 months ago when I was determined to make bread that we just can’t get where we live. Your recipes are easy to follow, always turn out perfectly, and I find myself wanting to bake more and more because of the success I have had with your recipes. I think you need to write a book! Can I use my Rye starter at a 100% hydration for these Bagels or do I need to make a wheat flour starter. Also instead of shaping the Bagels before they go in the fridge can I just put the dough in the fridge then shape them after the 4/8hrs proof. Could I bake them right after I raised them? I made them, let them raise to beauty perfection then put them in the fridge and they fell. So I was wondering if I could boil and bake them right after the raise. Thanks so much for this post. Why do you use milk powder? I haven’t seen any other recipes with it. Ooh, also…why non-diastatic? Don’t you want active enzymes? Thanks, Susan! I’m gonna give it a try. 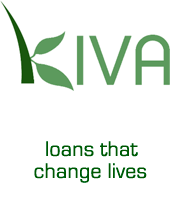 Much obliged for your help. I first made these several years ago with my first sourdough starter, and had super good luck with it. I’ve recently been gifted a kitchenaide and a new starter and, because of lack of time and the need for convenience foods, I’ve been mostly making variations of this recipe. This base recipe has been extremely reliable for me, although per usual you have to be aware of slight differences in water needs due to differences in climate (I’m in the super dry desert!) and flour (I sometimes throw in thirstier whole grains). I’ve also found it’s important to make sure to follow the directions for how dry/supple the dough should be, ensuring it’s kneaded properly (halving the recipe was too little for my kitchenaide and resulted in underkneading), and letting them have a full 4 hours for the bulk fermentation. Last night I made a variation without the dried milk (I didn’t have any and forgot to substitute the equivalent milk for water – something I frequently do), with a little whole wheat flour in the levain, and some mostly fresh, some dried herbs and dried garlic thrown in. I also experimented baking some in my cast iron skillet and some on a slipmat on a baking sheet. These are my best yet. The ones cooked in the skillet didn’t rise as much in the oven and I’m not sure if it’s because they were on a higher rack, went into a hotter oven (they were cooked first), and/or went into a hotter vessel. I’ll keep playing with this. Oh they looks so cute and must be yummy. Thank you for sharing the recipe. I can’t wait to make them this weekend!! Is your starter’s hydration 100%? (Do you always feed it with equal parts water and flour by weight?) Are you using high-gluten flour (or regular flour with added gluten)? If check to all of the above, it could be that you need to mix the dough more. It can take quite a while to develop the gluten sufficiently to get a strong dough. Yes, I always feed my starter with equal parts and have added high gluten flour. I don’t have a high-quality mixer – I mix and knead by hand. But the flour to water proportions I see here are only slightly less than what my regular bread recipe is, so I don’t understand how it can yield a thicker dough. Anyway, I baked them up, and while they were still a little too “bread-like,” they turned out pretty well. I will keep working on it. This is awesome, even better than some store bought ones, especially in places like where I am living now, which has problem buying nice bagels. Thank u so much for sharing. Given that the starter accounts for about 31% of the flour and I normally feed it with AP, should I do a couple of feedings with a high-gluten flour? Wonderful recipe! I’m getting a better rise and nicer texture from the sourdough starter than with my former bagel recipe which used commercial yeast. I’ve found that the KitchenAid dough hook attachment works well and puts less stress on the machine than the paddle attachment. A single recipe just about bogged down KA; with the dough hook I can do a double batch with no problems. Hello! I am without a scale at college and was wondering if you had appoximations for the measurements using measuring cups? Thank you so much! They look so good!! thanks for post.this’s so helpful for me! very delicious.i want do it now! I’ve made about ten batches of these in the past month, they are amazing. I’ve had a jar malt syrup in my pantry for years, and so I’ve been using a tablespoon or so in each batch. I’ve found I’ve need to reduce the water by about 10g, I’m guessing because of the syrup. I’ve generally left out the milk powder, due to family members dietary requirements, and think I prefer them without. This results in 7 normal sized bagels, and one dinky one, which is the perfect size for my three year old nephew. I knead by hand, and I find that a double batch takes about 15-20 minutes to get a decent window pane. 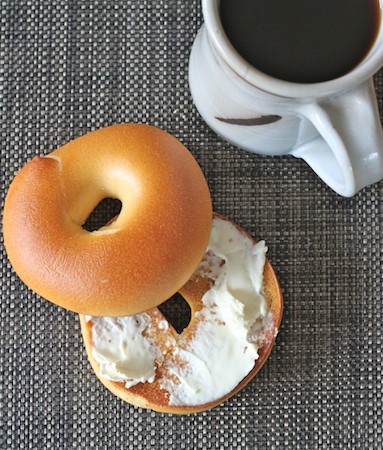 Worth it though – biting into one of these bagels is so satisfying. Thank you for the recipe, my batch is just coming out the oven, looks stunning, so easy to make. Hi,Susan. TQ for such wonderful recipe. 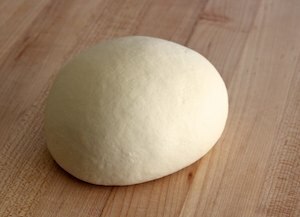 By the way, how do I judge the final proof for the dough before retard in the fridge, shall I still proof it for 4 hrs or jz observe if it is double in size, or can you recommend for the percentage rise? Fyi, weather here is always 37-40c. After I retard in the fridge, will it continue to proof in the fridge? These bagels looks so nice. 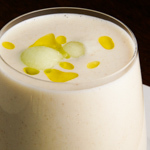 Hi there great recipe finally no yeast…. no offence!! Can I let them sit in fridge longer then 8 hours? I was late starting so now I’m at 6pm and it’s been 4 hours at room temp. Should I let them sit a room temp until bedtime then I’ll put them in fridge for a shorter rest in cool temp? I was wondering about a substitute for the milk powder?? I’ve not seen it in the shops. 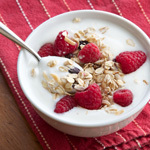 Can I substitute powdered milk for something else? I do carry powdered buttermilk but not powdered milk. 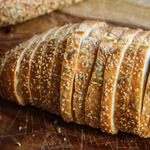 Great recipe … easy and very tasty even if you use all purpose flour (Canadian brand which is 13% protein).